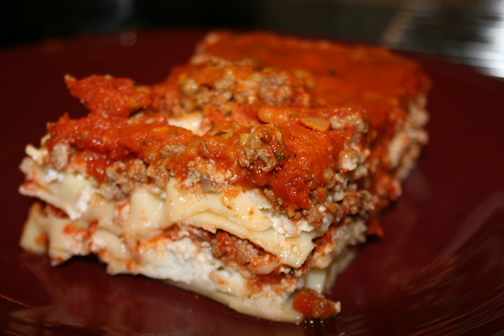 I know everyone has their favorite lasagna recipe and that you probably don't need me to post another one, but this is the one I use and like, so I'm putting it here for me. :) It's simple and kid friendly because it doesn't have "chunks" as my son would say or "weird green stuff". Brown meat, add next 5 ingredients and simmer until sauce is thick. Cook noodles according to package directions and rinse in cold water. Mix cottage cheese with next 5 ingredients (I usually mix this in a blender so it's smooth). Place ½ noodles in baking pan, layer ½ cottage cheese mixture, place a layer of mozzarella, then a layer of sauce. Repeat layers. Bake at 375 degrees for 30 minutes.